← Big Outdoor Living News: Porch and Patio Awards, Des Moines Home Show and…??? What is your Dream Backyard, Central Iowa? Maybe an inviting deck and patio space offering ambiance, functionality and beauty your family and friends will enjoy for years? Tell us about it and you could possibly win it! Yes, it could be – could be – that easy and thats the big news I teased you with in the last post. Its no longer a tease…its real…and its underway. 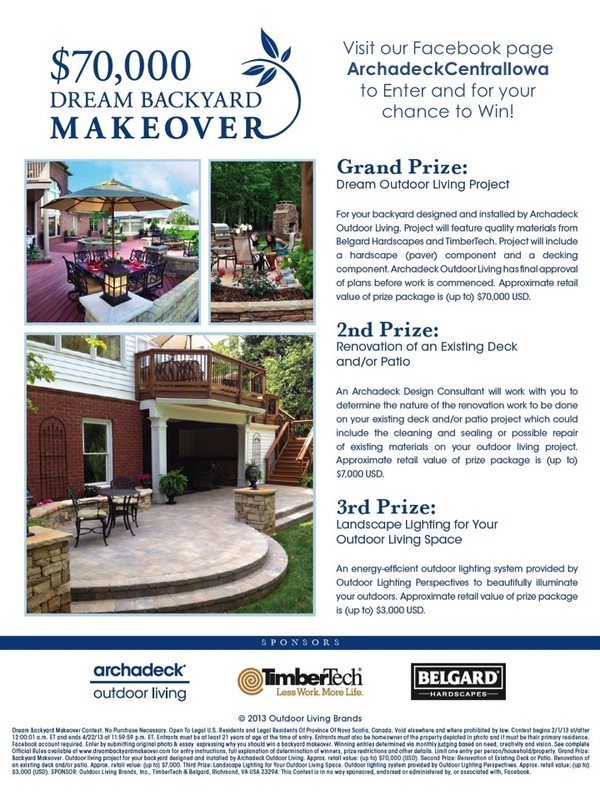 Archadeck of Central Iowa is excited to offer our market the opportunity to participate in our very first contest – your chance to win an outdoor living space Grand Prize valued up to $70,000! 2nd and 3rd Place prizes as well. Our franchisor (Outdoor Living Brands, Inc.), TimberTech (decking and railing) and Belgard (patios and hardscapes) have partnered-up to sponsor this nationwide contest across the Archadeck | Outdoor Living brand of outdoor living space designers and builders. S0, yes, not only will you be competing with your neighbors around the Des Moines area, you’ll be competing with our other 60 markets as well. That will make it more suspenseful, fun and impressive to win. And, as we are often told here in Central Iowa, you can’t win if you don’t play. So…go outside…errrr…go online and play! 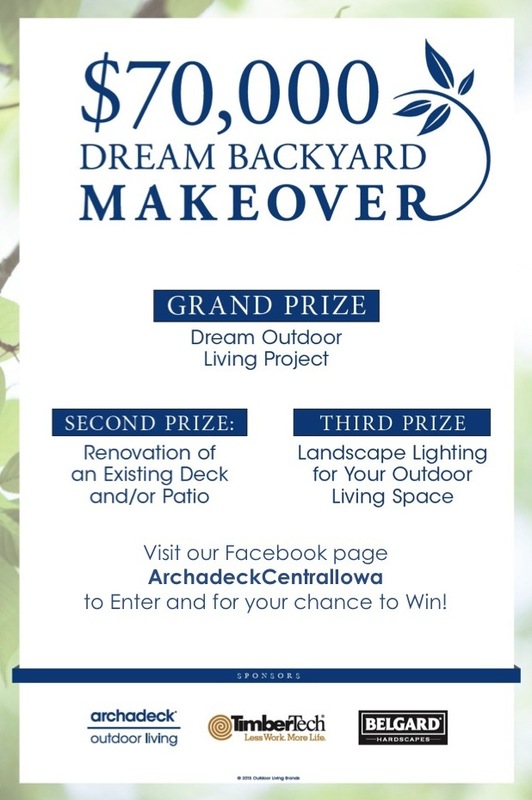 This Dream Backyard Makeover contest will play out over Facebook, so it does require you to like our Facebook page, ArchadeckCentralIowa, to enter the contest. If you already like us (“thank you”), click on the “Win a Backyard” icon to submit your entry. Rules, regulations, the contest entry itself and status updates are all available thru our Facebook page so check your news feeds and our wall regularly. The contest opened February 1st, 2013, and will close near the end of April, 2013. Two finalists will be selected each month. Fan voting (yes, you’ll even have some say in who wins) and sponsor selection from the 6 finalists will occur at the end of April. Again, for complete information, rules and regulations and, of course, your opportunity to enter and win, visit and like our Facebook page at ArchadeckCentralIowa. Many of the links here will take you there. Of course, you can get that awesome backyard with Archadeck of Central Iowa even without winning the contest. Our highly popular Archadeck Outdoor Living Design Guide, our industry relationships and expertise and our attention to design details bring dream backyards to life every day. And, contest or not, none of our projects just happen magically; they all take time…for design and planning ….for construction. Which is why we want to choose a winner by the end of April…so we can build the lucky winner’s project (hopefully yours!) later this summer. Better building by design. Value by design. It’s the Archadeck Difference – included in every project! The luck – you’ll have to provide! Good Luck! This entry was posted in Deck Lighting, Deck Railings, Decks and Decking, Outdoor Kitchens, Outdoor Living, Patios, Pergolas, Wood-Alternative Decking, Wood-Plastic Composites and tagged decks, fire pits, fireplaces, outdoor kitchens, outdoor living spaces, patios. Bookmark the permalink.